Keeping your sneakers clean can be difficult, but machine washing is a simple and effective way to maintain their luster. There is nothing fresher than a new pair of sneakers, but maintaining that “out-of-the-box” look can be a difficult task. No need to spend money on expensive specialty cleaners when they can be tossed in the washing machine and brought back to life! 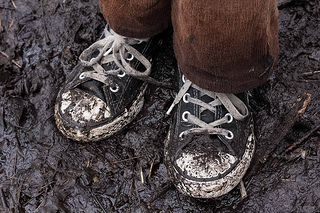 Remove the laces from the sneakers – if they too are dirty, wash them separately or replace them once the washing is complete. Attempt to remove large stains with a regular household cleaner and an old toothbrush or similar tool. Place the sneakers in a mesh laundry bag or pillowcase – this will prevent damage to the shoes, as well as the machine itself. Be sure to wash in cold water on a delicate setting with ½ cup of detergent. Due to the material that most sneakers are made of, drying can take a very long time. Try to resist the urge to expedite the process by using a hair dryer or similar. Again, this could cause your sneakers to never look or feel the same again. Machine washing your sneakers is the ideal way to get the longest life out of your kicks and have them go the extra mile!